I've been remiss in blogging, but my Flickr photo feed is full of photos. And that's your tongue twister for this month. I've been focused simply on getting all those boxes and bags and parcels and packages out the door and into the hands of the recipients that nothing else really mattered. The last package went out yesterday so I can now look at the photos and do a little blogging. Where to start? Last Saturday was the office Christmas dinner. We pick a place and have a nice sit-down dinner. We bring our spouses and kids and we discuss all sorts of things. Yes, work creeps into the conversations. How can it not, since that's why we know each other? But we talk likes and dislikes and plans for the new year and memories and it's a great time. 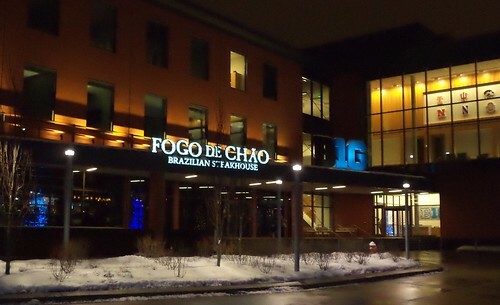 This year we went to a place called Fogo de Chao. It's a Brazilian steak house. The interesting thing, for me, is that it's located in the building adjacent to the Big 10 Conference headquarters. If you look at the far right, that is an Iowa Hawkeye logo there. 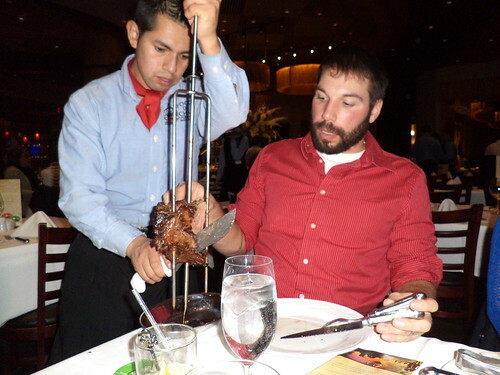 Never been to a Brazilian steak house and have no idea what it is? Here is what they specialize in. Essentially, it's meat on skewers. They have pork, chicken, lots of different cuts of steak and sausage all on skewers. At the bottom of the above photo, there is a small spot of green. It's a disc, green on one side, red on the other. When you want meat, you turn your disc green. Guys roam the dining room with this meat and come by the table asking if you want some. They also have a salad bar, but the main focus of a place like this is the meat. I'm not a big steak eater. They did have a chicken breast wrapped in bacon, sausages and a parmesan crusted pork medallion that were very good. 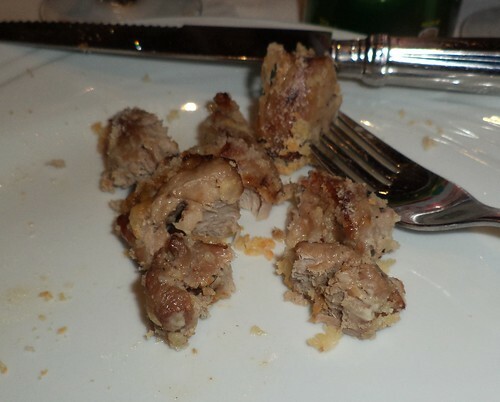 This isn't the best photo of the pork but take my word for it, it was very good. Every meat piece was spiced and cooked just right. The guys just loaded up on the meat, forget the salad bar, while we ladies investigated that. It was a "salad" bar. Individual ingredients were few. The bar contained a large variety of salads but no fruit. The last time we went to a Brazilian steak house, back in 2007, I could have spent my time eating off the salad bar. Anything and everything was on it from soup to fruit to nuts. This bar, while medium-sized, was not stocked as I would have liked. They do have a option to eat your meal off the salad bar and not take any meat. Since I no longer drink alcohol, I'm left with tea, water and soda for beverages. The server recommended this. 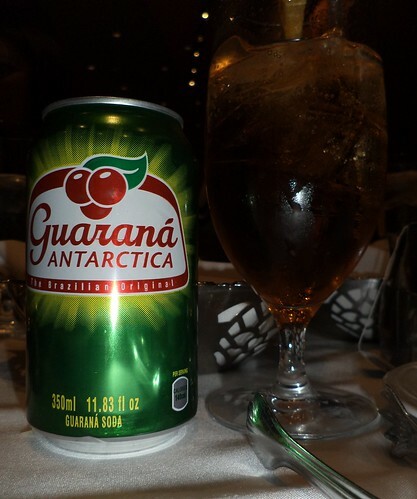 It's a Brazilian soda. It's kind of a cherry ginger ale, but not as fizzy or as sweet. It was served ice cold and it was really good. I'd buy this if I saw it in the store. It's got the tan color of ginger ale, which doesn't show up in the photo. I was quite pleased. 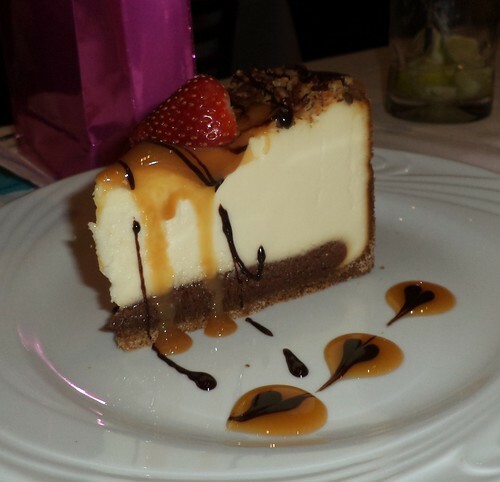 The best part of the meal was dessert. Half of the group got the turtle cheesecake. A small layer of chocolate under a tall layer of very creamy vanilla cream cheese, topped with caramel and chopped walnuts. Tara asked for a strawberry on hers. 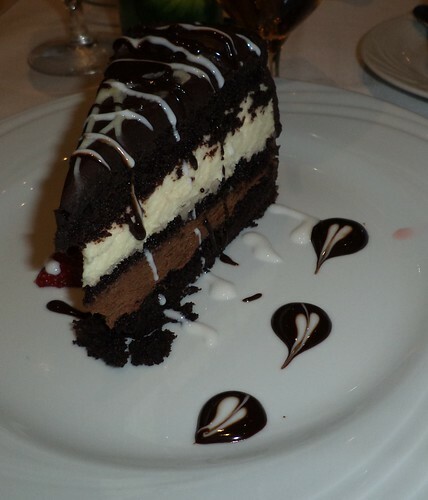 It was tempting but I opted for the chocolate mousse cake. Oh heavens was this good. Chocolate cake is sandwiches between milk and white chocolate mousse. The whole cake is topped with a semisweet chocolate ganache and drizzled with white chocolate. What we thought was a nice touch are the hearts on both our plates. I had a strawberry on the left side of my cake. It was a bit mushy and really is unnecessary to the presentation or the dessert. This was outstanding. We had a great time. My biggest criticisms of the place are its location and the lack of fruit on the salad bar. Finding your way to this place is an exercise in frustration, particularly at night, in a light snowfall. It's nestled at the back corner of a very busy retail area which has frustrating signage on where to go to park. Fortunately, parking was free when my ticket was validated, but I think the design of the whole area is not friendly to finding your way around. It's close to O'Hare airport and there are lots and lots of hotels around so there is a ready market for something like this. If you have a big appetite and like meat, this is a place to go. The other Brazilian steak house was much darker inside than this was and the noise level here was not as loud. That was rather nice. It had filled up as we were leaving and you could still talk at normal levels without having to yell and you didn't hear the conversations at adjacent tables. I wonder if it's open at lunch and, if so, what its offerings would be then. It's not a place I would frequent, but it was fun to go there. Is That a Bit of Green?